The brain. What about the brain? (SPOILERS) The latest awards-bait biopic is considerably more involving than the tepid The Intimidation Game, although it shares with it an apparent determination not to depict genius at work. The Theory of Everything is rigorous in its desire to present an upbeat story (just listen to that – actually very good, but still, it’s far from subtle – score). It’s as unpolished in its plotting as it is lustrous in its cinematography. Mostly, though, this is an okay “triumph over adversity’ film, fairly typical of its type, but anchored by outstanding performances from Eddie Redmayne and Felicity Jones. I didn’t know much about Stephen Hawking’s cosmological theories before seeing Theory. I didn’t have much interest either; the little that had filtered in seemed to reference concepts I found far more accessible in your average science fiction tale. Having seen Theory, which will probably reach a wider audience than A Brief History of Time (which has probably been read by a miniscule proportion of those who bought it), I can’t say my interest has been piqued. This is an area in which the also-Best Picture Oscar-nominated The Intimidation Game also flobbles about unconvincingly. 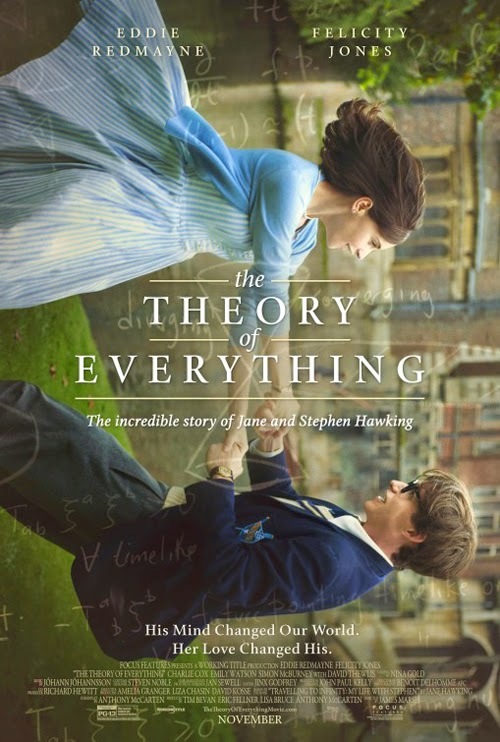 Screenwriter Antony McCarten fails to deliver the science behind Hawking’s ideas, not just in terms of why his ideas made such an impression within the scientific establishment but also in terms of their practical explanation. After all, Hawking wrote that book for scientific luddites; you’d have thought Theory could at least try to embrace that spirit (on the other hand, as noted, people are actually watching the picture). One might come away with the impression that Hawking is a great because he is populist, and because of his memorable voice software. Which is probably what one went into the film thinking. The best we get is a lecture where one peer walks out of Hawking’s (Redmayne) rumination on how black holes aren’t entirely black while a Russian proclaims him a dear little genius (he was unable to predict a psychotic robot with human eyes lurking deep within such galactic bodies, however). Oh, and Hawking’s mate Brian (not real, but not not-real in the A Beautiful Mind best mate sense) not-really explaining his theory in a pub with beer foam (you can all-but see the wheels turning in the minds of director and writer; that’s how we explain Hawking to masses! Thirty seconds in a pub!) There’s also swirling cream in coffee and fireworks. The Hawking “view” and leaps that any genius in his or her right mind must make in order to attain the mantle of genius are relayed in a sufficiently pretty fashion (the film is exclusively very pretty, and will do wonders for Cambridge University applications, not that it needs any encouragement, of course), from blurring dancers at a May Ball to a blurring fire seen through the gauze of a pullover. But they’re entirely pedestrian visions of vision (there’s a persuasive sense of the history of great academicians at Cambridge, and David Thewlis is great as Hawking’s benevolent tutor, but that’s as far as it goes). Jane (Jones) even rehearses hubby’s ideas, bored and well versed, to future spouse Jonathan (Charlie Cox), and that’s it. It’s not really that important, I guess, not next to everything else that didn’t make him famous. I also wonder if getting hung up on the science versus God debate is a little tiresome by this point, and a bit of a blind alley. Post-Dawkins, how about, for a change, trying to engage positively with the theory, rather than getting mired in polar viewpoints? Belief may have fed directly into the relationship between Jane and Stephen, but it airing it this way undercuts the ideas of the man. Indeed, it serves to add to the sense that Hawkins notions aren’t really all that. It’s the sort of picture, you know the ones, (struggle against adversity + scientific genius = a shower of awards nominations), that’s crying out for a more offbeat and daring approach. Particularly in this case, dealing as it is with the cosmic and quantum range(s) of things. Terrence Malick might never get involved with something so overtly atheistic (although, coming from Hawking’s wife’s memoir, there’s a liberal dose of God in there), but jumps from intimate to universal are really lacking; the picture needs such balance, so it doesn’t entirely become a story about Hawking being loved and respected for (or despite) having motor neuron disease. Which is, basically, what it is. That said, Theory is compelling in respect of the relationship between Hawking and Jane. I was most impressed that it isn’t just a film about Hawking, side-lining the true strength behind the wheeled throne (this was before I saw the end credits and realised why). Jane’s role and the weight thrust upon her in raising a family of three (another aspect I was oblivious to; the picture makes a point of establishing Stephen’s fully-working cockmanship, although it stops short of showing him visit Stringfellows and instead settles for a browse through Penthouse), along with a husband who needed to be constantly cared for, solo, certainly needed due recognition. There isn’t much care spent finessing the introduction of elements (incoming Daredevil Charlie Cox as choirmaster and eventual second husband Jonathan Jones arrives on the scene once we’re shown the burden on Jane) but the performers repeatedly strive for nuance where the writing is perfunctory. When Hawking leaves Jane for sparky redhead nurse Elaine (Maxine Peak, deliciously commanding; probably an understatement in respect of the real Elaine’s alleged abusive behaviour), leaving her free to marry Jonathan, there’s a feeling that Marsh could have measured the tone a bit better. Although, the resulting tone is one where everything turns out fine for everyone concerned, which is exactly the aim, I suspect. But it means it all seems a bit schematic. Jane gets her man in the end, Stephen gets adulation (but not, ultimately, the girl), and so it’s all something to feel great about. Likewise, Marsh and McCarten can’t resist playing up for dramatic purposes (Hawking has a seizure at the opera, so aren’t the surroundings gorgeous?) If it had been up to those damn Swiss, Hawking would be dead! The scene meeting the Queen is a bit of a meal of a moment, although it sat least serves to show how the two of them reconciled. Actually unnecessary is the scene where Stephen takes up her (an attendee at a lecture) pen and walks. In his mind, of course. It’s overkill, in a film that has trodden a fairly dependable line in not over stating its characters. The final brief history of Stephen Hawking in reverse is a further inevitability and sign of an uninventive biopic (but aren’t they most?) that probably thought it was full of great ideas. Daniel Day Lewis may have used up all the wheelchair Oscars, and co-nominee Bendict Cumberbath may have got in there first in Hawking, but Redmayne’s performance is flawless; sad, funny, moving. You forget you’re not watching the man himself. Jones is right with him beat-for-beat, and has also been justly nominated. It also credits the makers that they exercised restraint with the make-up (they didn’t necessarily elsewhere). No one’s convincing anyone that a bit of grey is going to make Jones look older than a slip of a girl, so having Countdown in the background helps to one get one's bearings. The ins and outs of who deserves more sympathy for the disintegration of their marriage are sidestepped (as it plays out, Jane is tacitly permitted to wander while Stephen deals a crueller blow). There’s always a problem becoming too fixated on the facts with real figures, at the expense of whether the tale being told is told well. This is a tale told reasonably, but that is chiefly so because of Jones and Redmayne raising the material. It raises the question of whether there’s any point making biopics when they tend to be run-of-the-mill. Rarely a great one comes along, but that’s usually because it plays fast and loose with facts and form (Amadeus). Certainly, there seems to be little point – in the vast majority of cases – rehearsing such material during the lifetime of its protagonist. 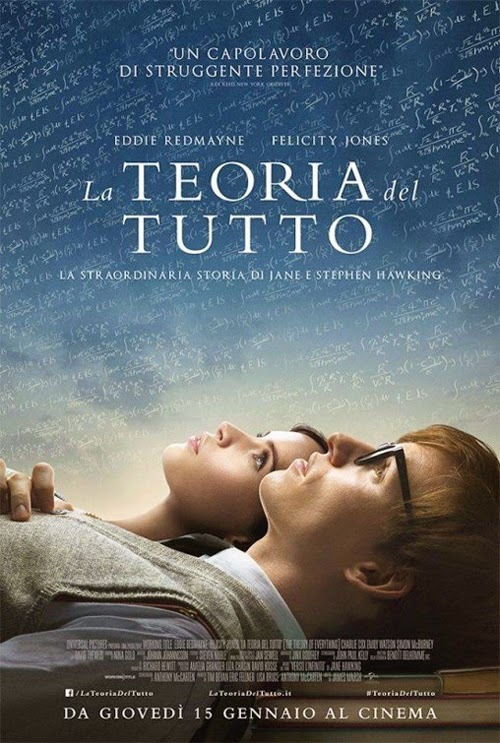 So, The Theory of Everything is a triumph. You can tell it is, because of all the “This is where you well up” moments delivered via Jóhan Jóhannsson’s tear-jerking score (good job, Jóhan!) Never mind the little details. Such as, “What was it that made you so brilliant again, Stephen?” This miraculous tale (there you go, it’s God at work!) knows how to milk its audience. It may not be one I’m going to remember for its content (was there even potential for a Hawking biopic in there; about his theories, that is? ), but its performances will linger. What do you do in the group? But I wanna see The Blob! On the roads it was a white line nightmare. I’m a friend of the family. Hey, how fast do they pitch in cricket? I never earned a nickel from another man’s sweat! I'm going to show you something beautiful. There's no earth-shattering hump in the works? No one cares about reality any more.